Lux is the next champion to receive her own comic series. League of Legends fans received their first glimpse of the next comic series from Riot Games’ partnership with Marvel Entertainment today after the series became available for pre-order. The series will follow Lux and the complex net of relationships found in the Demacian region where magic is banned, but not much else is known about the comic. Riot has yet to announce the comic’s digital release date, but the five-part series can now be pre-ordered from Amazon. 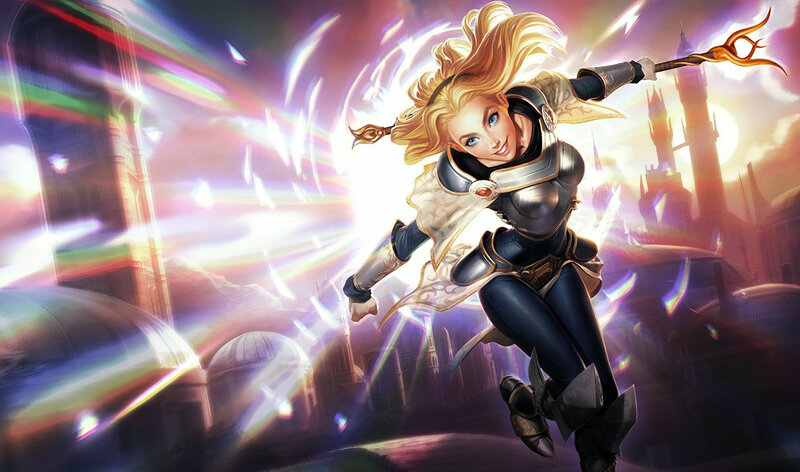 According to the comic’s cover, the title will simple be called “Lux.” The series’ synopsis previews Lux’s journey to better understand her magical powers while living in the city of Demacia where magic is outlawed. On the comic’s cover, Lux stands in between her brother, Garen, and the game’s newest champion, Sylas. The cover is split–Garen’s side is brightly lit with a baby blue sky, while Sylas’s side is dark red, casting the mage in shadow. Sylas’s release earlier this year gave fans of the game a darker take on Demacia, a region that had always been hailed for its fair and just nature. According to his champion biography, Sylas is visited by Lux while imprisoned by Demacia for losing control over his magical powers. The two form a friendship, exchanging knowledge of magic for news of the outside world. Sylas manipulates Lux into smuggling a tome into his cell, and he uses it to escape his execution. The comic series will likely dive into the relationship between the two characters as well as the strain it puts on Lux’s relationship with her brother, although League of Legends fans will have to wait for the comic’s first issue to read more. Fans of the game can now pre-order physical copies of Lux’s upcoming comic series from Amazon for $15.99. The collection comes with all five issues and will be released on Nov. 19. The collaboration’s first comic series “Ashe: Warmother” wrapped up toward the end of March with its fourth and final issue. While the comic is still unavailable in a physical format, fans can read about Ashe’s journey on the League of Legends Universe.